Adrian Thaws is one of Tricky's most successful attempts to achieve reconciliation between the strengths of his established sound, and his need to progress as an artist. You never know exactly what you are getting yourself into when you plop the new Tricky record on the turntable. Mercurial, inconsistent, and relentlessly inventive, Tricky, aka Tricky Kid, aka Adrian Thaws, has never been content with a single style, sound, collaborator, or collaborators. Every new release shows the listener a new side of his rambling, disoriented, compelling mind. His debut solo record Maxinquaye became a stone-cold classic the moment it was released. I remember being 14 years old in 1995 when it was released and borrowing it from a friend at school. The haunted, mumbling, post-apocalyptic sound world it assembled sounded like nothing I had ever heard before and brought the old goose-bumps right up. I still get goose-bumps listening to tracks like "Overcome" and "Hell Is Round the Corner". Maxinquaye had very few flaws or unnecessary moments in it. Tricky never quite achieved this level of seamless quality again, but he has never released anything that was not worth listening to or puzzling over either. Records like Angels With Dirty Faces and Blowback may have left some listeners scratching their heads, but even when Tricky never really finishes unpacking his own ideas, the contents of his mental luggage are still interesting. The self-referentially titled Adrian Thaws is Tricky’s most consistent record in a good, long while. Adrian Thaws sees Tricky playing to many of his '90s-era strengths, tapping into the groovy, hypnotic, rambling trip-hop that made so many of us fall in love with his work back in the good old days. There are moments on Adrian Thaws that seem almost too '90s nostalgic, like the jump-up jungle to be found on "Why Don’t You", which sounds like something off of David Bowie’s polarizing 1997 album Earthling (I will leave it to the individual reader to decide if this is a good thing or not). Nobody can mumble quite like Tricky, and he gives us some excellent examples of his circuitous, stony, mesmeric whispering on Adrian Thaws. Album high points like "I Had a Dream" and "Palestine Girl" make the listener feel like they have accidentally eaten an extremely potent pot brownie and gotten lost in some squalid, rain-soaked part of a city that they have never visited before. Tricky’s music has always had a peculiar, wonderful quality to it that makes one feel as if the music is somehow being pumped directly into the listeners mind, and Tricky’s mumble is the voice of the listener’s own paranoia. Adrian Thaws is not without missteps. The unnecessary skit "The Unloved" is a just a series of cliches about "the fallen soldiers of the street" and the need for a "revolution" of unspecified content. The skit is distracting and Adrian Thaws would be a stronger record without it. Virtually every track sees a new vocalist or collaborator, and this mostly works in the album’s favor. The stylistic diversity and host of collaborators usually keeps Adrian Thaws feeling fresh and interesting, even when certain tracks feel somewhat out of place, such as on the fairly straight-forward hip-hop of "Gangster Chronicles" or the house groove of "Nicotine Love". 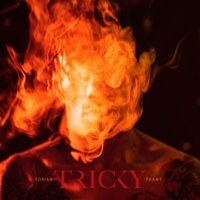 When all is said and done, Adrian Thaws works best when Tricky plays to his strengths, and delivers the spooky, haunting, claustrophobic trip-hop that made him famous. Tricky has been an awkward position for most of his career. With Maxinquaye, he created a very distinctive, unique sound that was at once both definitive and restrictive. He has struggled ever since to mature as an artist, without losing sight of what made him unique in the first place. Adrian Thaws is one of his most successful attempts to achieve reconciliation between the strengths of his established sound, and his need to progress as an artist.